These days it seems like everyone especially healthcare professionals have fallen in love with the iPad. Since the launch of Apple’s iPad in 2010, doctors and other healthcare professionals have been bringing them in their offices and onto hospital wireless networks. With the continued growth of hospital wifi, so to has the use of iPads. They present healthcare providers with ways to improve care and documentation workflows, provide improved and more engaged patient interactions, and to deliver instant easy access to medical references and tools. Healthcare professionals love their iPads; in fact their adoption of the iPad has exceeded expected growth. Actually, Manhattan research found that tablet use, predominately iPad use, among U.S. physicians had doubled in one year with 62% of doctors reporting that they regularly use a tablet for professional purposes. Half of them use iPads in point of care situations involving patients. After surveying both doctors and nurses, Aruba Networks studies found that 85% of those surveyed support BYOD. 83% reported iPad use making iPads the most commonly used personal devices with iPhones or iPod touches coming in at 65%. They expect iPads will only continue their rapid proliferation into the medical field too! Apple’s new iPad Mini that was released in October is expected to be a huge hit with doctors and could cause the rate of adoption to accelerate even more. A small survey conducted earlier this year by Epocrates found that one-third of physicians were planning to buy one. The biggest reason being the smaller size, which just so happens to perfectly fit most lab coat pockets. So you are likely to start seeing these smaller iPads peeking out of many physicians’ lab coat pockets. So the love of iPads in healthcare is obvious, but what are exactly some of the reasons why? Here’s a list of some of the top ways doctors are using iPads in hospitals that make them adore these devices. The medical field is constantly changing, so keeping healthcare professionals up-to-date with the latest medical information is imperative, but sometimes difficult for busy physicians. 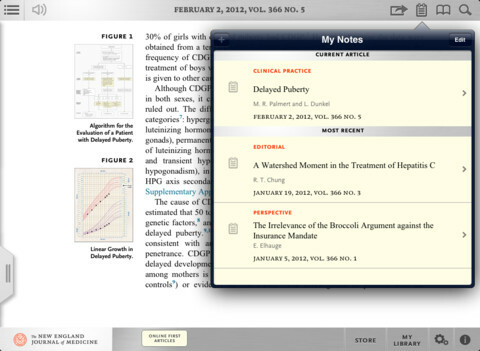 iPads make keeping up with all this new medical information much easier with apps like Newsstand, which allows physicians to easily access and flip though all the latest medical journals. Any new books, reference material, or notes can all be kept on their iPad and accesses when they get a spare moment throughout the day. Communication enhancement between doctors and patients is central to improving point-of-care. Sometimes verbal descriptions or even static medical images simply cannot deliver the information the patient needs to get the complete picture. 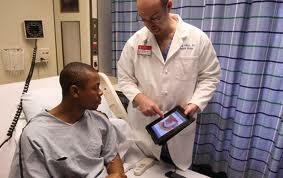 iPads allow doctors to more clearly explain illnesses, injuries, procedures, and treatment options with multimedia. iPads can also facilitate doctor-patient engagement virtually through the use of online portals as well. This allows patients to gain a fuller understanding of their medical treatment and any potential complications. The iPad offers electronic medical records (EMR) is the form of a small sleek mobile devices that’s definitely much easier to keep up with than a clipboard full of papers or a laptop. Doctors that still use laptops for EMR find they sometimes create a barrier between doctor and patient that iPads can prevent. iPads offer quick and easy access to EMR anywhere at any time. much more accurate than the pen and paper method is the Mersey Burns app. It generates rapid and exact calculations for fluid management, which is critical for burn victims. Healthcare professionals consider the iPad very helpful when performing hospital rounds, a time when physicians are truly mobile. When on rounds they can’t just conveniently leave a patient to access a PC. With iPads they have everything they need to pull patient records, document visits, and makes notes with the swipe of a finger. With iPads hospital rounds are faster and easier than ever. 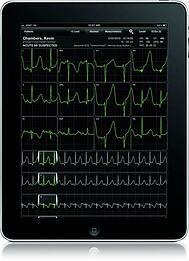 iPads are incredible mobile devices that have the ability to make a huge impact in healthcare. They are changing the way medical professionals perform and improving overall workflow and ultimately the quality of patient care. 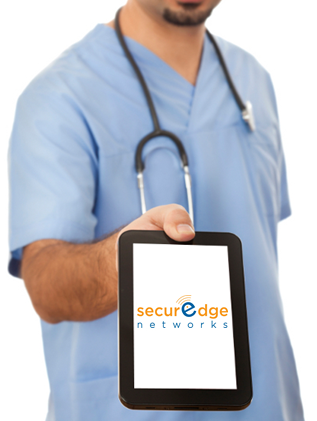 If you need help preparing your hospital wireless network for iPads and other mobile devices you can contact us here with any questions or for a free consultation. SecurEdge understands the importance of new mobile devices like iPads create new challenges for IT departments ranging from new sets of securities, configurations and management. We can also provide your hospital wireless network with the security and management it needs to authenticate and track users on the wireless network.